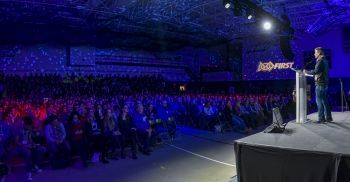 Dean Kamen, President, DEKA Research & Development and Founder, FIRST, addressed a crowd of more than 1,000 people at the 2018 FIRST Robotics Competition Season Kickoff at Southern New Hampshire University. MANCHESTER, N.H., January 6, 2018― Inventor and FIRST® Founder Dean Kamen launched the 2018 FIRST® Robotics Competition season today with the Kickoff of a new robotics game called FIRST® POWER UPSM before a crowd of more than 1,000 people, including Governor Chris Sununu and Senator Maggie Hassan (D-N.H.), at Southern New Hampshire University in Manchester, New Hampshire, hometown of FIRST Headquarters. More than 91,000 high-school students on 3,647 teams at 137 venues around the globe joined the 2018 Kickoff via Twitch Live Broadcast. FIRST POWER UP finds FIRST Robotics Competition teams trapped in an 8-bit video game. Each three-team alliance has three ways to help defeat the boss: Tipping the scale or the alliance’s switch in their favor to earn points, exchanging power cubes for power ups (force, boost, and levitate) to gain a temporary advantage during the match, and climbing the scale tower to face the boss. The alliance with the highest score at the end of the match, which includes autonomous and teleoperated periods, defeats the boss and wins the game. FIRST Robotics Competition student participants measure the field for the 2018 season game, FIRST POWER UP. At today’s Kickoff, teams were shown the FIRST POWER UP game field and challenge details for the first time, and received the Kickoff Kit from the Kit of Parts, which is made up of motors, batteries, control system components, construction materials, and a mix of additional automation components – with limited instructions. Working with adult mentors, students have six weeks to design, build, program, and test their robots to meet the season’s engineering challenge. Once these young inventors build a robot, their teams will participate in one or more of the global 158 Regional and District events that measure the effectiveness of each robot, the power of collaboration, and the determination of students. By participating in FIRST, students gain confidence to explore the innovation process while learning valuable science, engineering, technology, teamwork, and problem-solving skills. FIRSTRobotics Competition participants are eligible to apply for more than $50 million in FIRST Scholarships from leading colleges and universities. Students also learn and apply the FIRST ethos of Gracious Professionalism®. Senator Maggie Hassan (D.-N.H.), Donald Bossi, President, FIRST; Dean Kamen, President, DEKA Research & Development and Founder, FIRST; New Hampshire Governor Chris Sununu; Manchester Mayor Joyce Craig; and Dr. Woodie Flowers, FIRST Distinguished Advisor, and Co-Chair of the FIRST Executive Advisory Board; Pappalardo Professor Emeritus of Mechanical Engineering, Massachusetts Institute of Technology at the 2018 FIRST Robotics Competition Season Kickoff. Governor Sununu celebrated the willingness of FIRST participants to innovate. “The robots are great, the competition is great, but what FIRSTis all about is the kids that step up, that are open to something they haven’t explored before, that can try something they haven’t tried before,” he said. The 2018 FIRST Robotics Competition Kickoff event is an opportunity for teams from all over the world to come together as a community to share in the excitement of seeing the new game unveiled. Teams at local Kickoffs in Australia, Canada, China, Dominican Republic, Israel, Mexico, Turkey, and the United States watched the proceedings via live broadcast. For a replay of the Kickoff broadcast, click here. 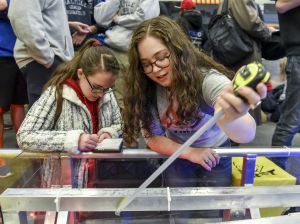 To find FIRST Robotics Competition events and/or teams in your area, visit https://www.firstinspires.org/team-event-search. Enhance your FIRST® Championship experience. App includes detailed program schedules, interactive maps, activities, team info, alerts, and more.